[Editor’s note: What is a country? A nation? A nation-state? By some counts, there are about 195 “countries” or 194 (US State Department) in the world, but by others like the ISO and United Nations, about 245 which includes extra “regions” for statistical reasons or FIPS code assignments. The World Bank (2) says 186 or 210. How can there be such a wide spectrum of valid answers? The issue is complicated by historic colonial relationships with overseas dependencies and affiliated political administrative units, and by the non-uniform way different “countries” sub-divide themselves. For instance, France considers all it’s “dependencies” unitary parts of France, while the U.S. does not view it’s own territories equal to states vis-a-vis constitutional rights. But some unitary parts of France outside mainland Europe get treated differently from Metropolitan France by the European Union (they don’t necessarily get an E.U. passport). This week, Greenland steps closer to becoming one of the club of 195 “countries” in the world, but really it’s just getting more quasi-self-government (sticking in the 245 bracket) within the Kingdom of Denmark’s administrative umbrella (which is and is not the same as the “country” of Denmark) for defense and foreign policy. The higher number doesn’t even address sub-national semi-autonomous entities like the United Kingdom’s England, Scotland, Wales, and Northern Ireland which fall somewhere between what we in the U.S. think of as “states” and “provinces” (1st order admin units) and those top level countries and nations. Nor does it address disputed or break away regions like Abkhazia. Two tonnes of rare whale meat were distributed in Greenland as part of celebrations to mark the start of an era of self-government. After nearly three centuries of rule by Denmark, Greenland’s 56,000 people will gradually take control of most domestic affairs, although defence and foreign policy remain in Danish hands. Greenlandic is now the official language. Photo by: Adam Roberts. 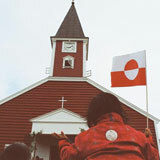 Continue reading related story, “Greenland’s future: Divorce up north?” from Nov. 27, 2008 . . .